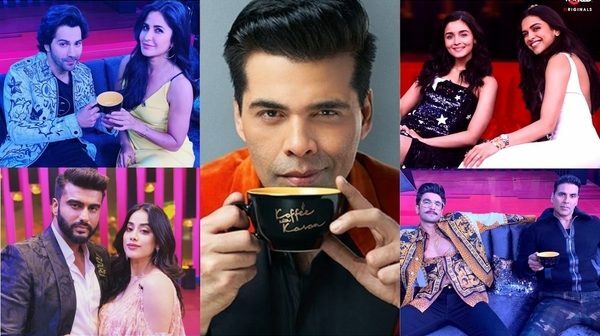 October saw the return of everybody’s favorite talk show, Koffee with Karan (KWK), hosted by industry insider and award-winning filmmaker Karan Johar. As KJs is no stranger to the drama that surrounds B-town, the shown has become infamous for spilling the beans (and no, we don’t just mean the coffee variety), as it features quizzes and controversial opinions, as well as the popular Rapid Fire round, in which guests are encouraged to address ongoing rumours. Plenty of celebrities have graced the couch over six successful seasons; join us this month as we rank some of the show’s biggest fashion hits and misses. Ranveer Singh is known for his quirky sartorial selections and throwing gendered fashion norms out of the window by refusing to shy away from traditionally feminine silhouettes, such as ankle-length skirts and floral ensembles. During his appearance on the latest season, Ranveer proved his love for print yet again in a matching shirt and jacket by Versace, paired with black trousers. He accessorised his outfit with gold-rimmed glasses and a layered gold chain. 2. Timeless beauty Madhuri Dixit Nene’s fashion choices almost always reﬂ ect her sophisticated persona. 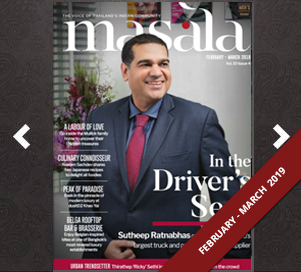 During season four, Madhuri looked her starry self in an intricate bright pink and gold sari by Sabyasachi, as she shared the couch with Juhi Chawla, her rumoured rival during the peak years of their careers. Despite murmurings of a spat, it was clear that the duo enjoyed each other’s company as they chatted about the inner workings of the industry and their personal lives. 3. Whether seen walking along Mumbai’s streets or gracing the red carpet, Ranbir Kapoor has become synonymous with effortless chic. A prime example of his keen eye for fashion was his outfit in season four, where the actor looked dapper in a bright blue suit by British design Paul Smith. He completed the look with navy loafers, a statement watch, and a casual tartan pocket square. 4. As Bollywood’s queen of controversy, it was no surprise that Kangana Ranaut’s appearance on KKW season five was one of the series’ most memorable. Her take-no-prisoners approach to addressing gossip was clear when she dragged KJo for being a “flag-bearer for nepotism”. Luckily for Kangana, her fashion choices were far less scandalous as she looked elegant in a white midi dress by Victoria Beckham. Her playful ombre curls and a bold red lip effortlessly complemented the ensemble. When it comes to sartorial choices, Malaika Arora hardly ever disappoints. However, she suffered a massive style blunder while appearing on the final episode of KWK seaons five alongside Neha Dhupia, Ayan Mukerji and Rohan Joshi. The ‘Chaiyya Chaiyya’ beauty opted for a black figure-hugging dress with a mermaid hem from Avaro Figlio’s 2016 collection, accessorising with tassel earrings from Cult Curators. Unfortunately, the combination of a tuxedo neckline and cheap looking fabric were nowhere near flattering. Next ! 2. Another fashion victim on season ﬁve was Neha Dhupia, who graced television screens in a multi-coloured kaftan-inspired jumpsuit by Indian designer Nupur Kanoi. Although stripes are ﬂattering when worn correctly, the outward diagonal direction of these resulted in a bit of a disaster. The bold print coupled with the wide leg just added unnecessary inches to her frame. It’s safe to say some looks are better left on the runway. 3. Akshay Kumar’s long-running fashion evolution has seen everything from awful haircuts and ill-ﬁtting jeans to suave three-piece suits and trendy athleisure looks. Unfortunately, during his appearance on season four, Bollywood’s Khiladi looked nothing like himself in an Emporio Armani suit jacket, steel grey t-shirt and dark denim jeans. And if the mismatched outﬁt wasn’t bad enough, his unkempt beard made it look like he skipped his morning shower. 4. Not one to shy away from experimental looks, Jacqueline Fernandez made the brave decision to dress like a giant fire hydrant for her appearance on season five. We’re not sure what her motivations were, or what flames she was worried about putting out, but the sheer red blouse and ankle-split trousers by Prabal Gurung definitely did not work. Lets just say we expected much better from this Bollywood beauty.